I have recentlymigrated from FRAPS to Action but I am having a couple of issues. 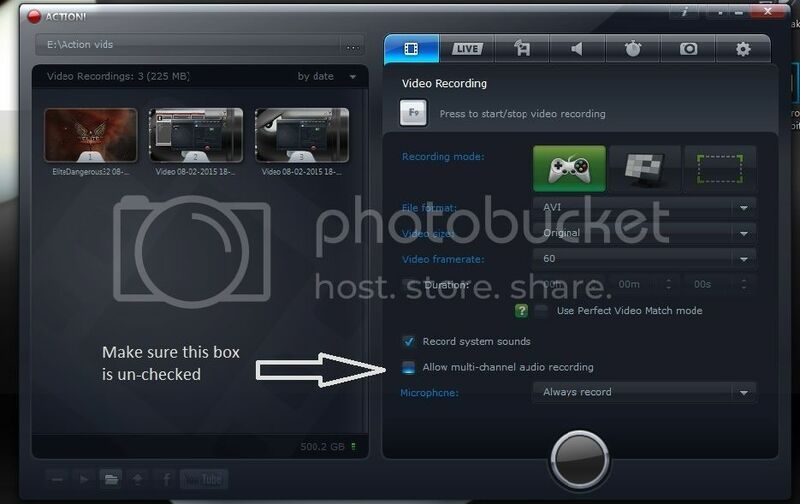 I am also getting a problem when I try to record the microphone in a separate audio track it records no mic input at all but if I un-tick this option I can record the microphone no problem at all ! I am hoping these issues are just some settings I need to change but I would appreciate any pointers my PC specs are below thanks in advance. Ok I figured the no sound thing out you need to make sure the Allow multi-channel audio recording is un-checked otherwise Sony Vegas will not import sound. After 2 hours of trial & error simples. Still not sure about the microphone thing though. What are your audio balance settings? Also if you are exporting from Action! and recording your Mic separate then it may be that you are only exporting the system sounds and not your mic. It gives you the option to export either Audio 1 or 2. 1 is the system sounds and 2 is the mic. I wish they gave you the option to include all tracks when you export. I was having the same issue with multi-channel recordings. But turning that off and recording my mic separate worked for me. I have my audio balance set to 98 for mic and 2 for system sounds. Action! really seems to favor my system sounds over my mic. I could probably turn down my system volume to fix this as well. But, yeah I think it may be your audio balance, or system settings for your mic. Can you hear your mic just fine when you watch the AVI from Win Media Player?